Southwest 35 and gusting, yes last night was a gale, and the sideways rain and howling wind made us all appreciate a land based lodge here at Langara! 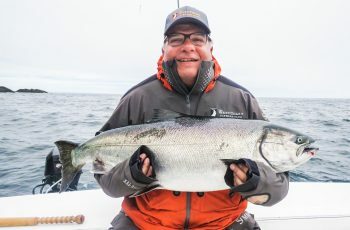 The weather has now let up and we have some nice fish to report, although chinook fishing has been slower the last couple days. We are having small waves move through the area, the East Side has come back from the dead. I snuck out in 30 knots of wind last night after work with the store clerk and we had fantastic fishing in hideous weather, sideways rain and a howling wind at Coho Point. No boats but plenty of chinook eagerly biting cut plugs fishing deep. 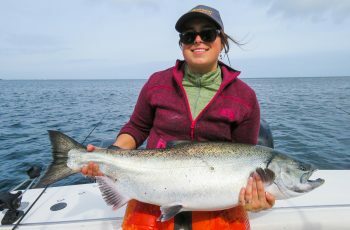 Arden fished 75 feet and hammered the tar out of em on her side, grabbing several nice low twenties and a handful of coho in short order. I fished the port side and was busy as well, never noticed the screaming wind and the drenching conditions. With that recon under the belt, the boys who fished this am headed to Coho Point in a downpour and 25 knots of wind. 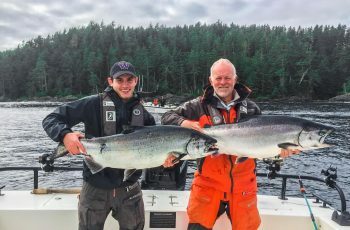 Fishable water greeted them and the guides returned with three over 40 lb chinook. I slept in as did my guests, we don’t fish in those conditions, ha ha! Paul had a 40 guided by the miracle child, Todd’s boat had a 44, and Craig Mackenzie had a 42, I believe with Tanner. 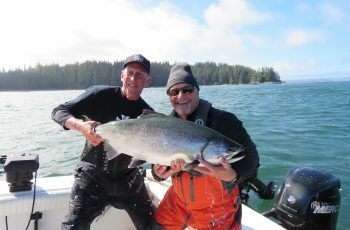 I saw Pat Skwarok with a 32 and this PM Jordie found our biggest release of the day, a 35 for John Thompson. Nice to see one go back, well done guys, we need to remember this is where it is at up here now. 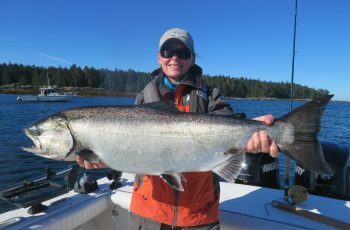 Conservation of large fish is paramount for future large chinook fishing! 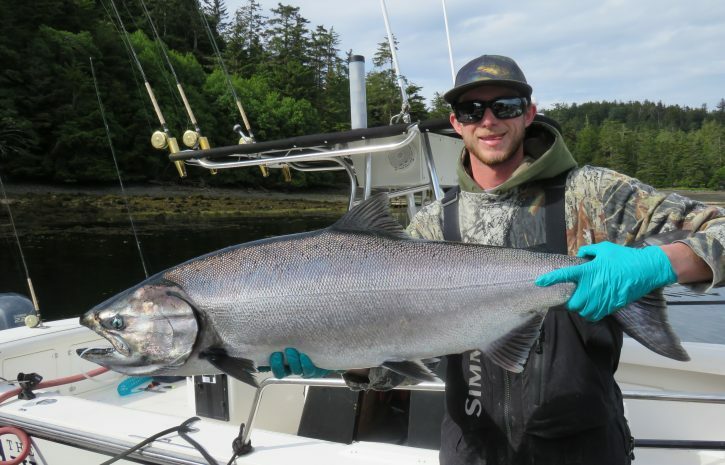 Fishing is good for coho, but the chinooks have slowed somewhat. Any day three over forty are taken though, not bad! I thought the afternoon fishing was slow, boats scattered and the tide was screaming. Tomorrows weather looks good, so we might have a better day in here. Conman turned 25 today, and he spent his birthday out at Coho Point in the bitter wind and whitecaps, loving every minute of it. I think he was disappointed he had to come in for lunch. Ask most guides what they want to do on their birthday, most would be out fishing. Nice to see the fish moving up the east side again, bait showing up, and yes, the Lions took a day off. All in all a wet day in here but relatively productive one for size, we will see what tomorrow brings, goodnight from the Clubhouse. Mike Tonnesen, Head Guide, Screamer.